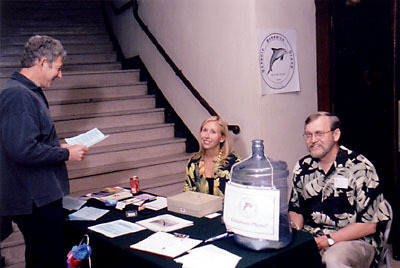 OCEANIC RESEARCH GROUP'S 2006 FUNDRAISER! 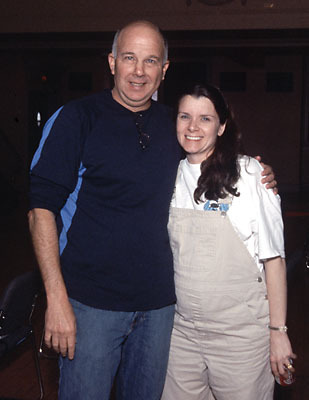 THE 2006 BENEFIT WAS A GREAT TIME!! THANKS TO EVERYONE WHO CAME OUT! For the 4th annual O.R.G. 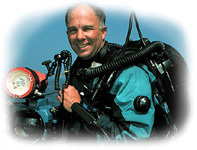 benefit we were thrilled to present world renown underwater photographer and film maker Marty Snyderman! World-renown underwater photographer and filmmaker Marty Snyderman presented Sharks in the Wild, a slide/video presentation on the natural history of sharks. Mr. Snyderman has spent over 20 years photographing sharks around the world. 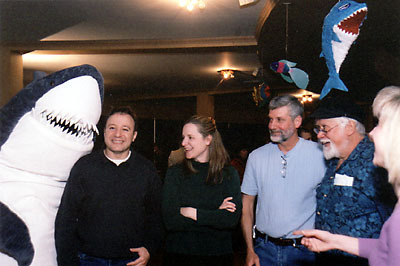 In addition, he has made several television documentaries about sharks that have aired on PBS/Nature and Discovery Channel, among others. 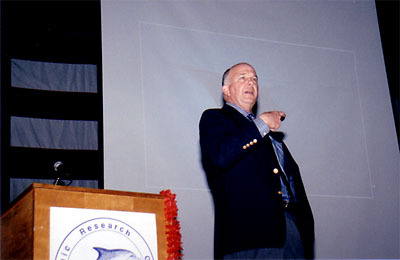 Emmy Award-winning cinematographer Jonathan Bird presented the first scenes from his new high definition film "Secrets of the Reef." This amazing program explores the hidden behaviors of animals on a remote reef in the Philippines from cleaning stations to predation and reproduction. O.R.G. 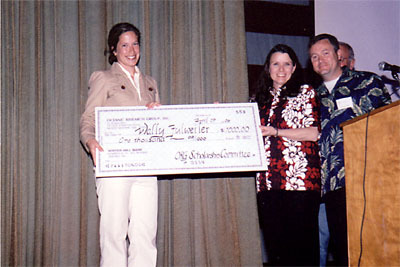 Treasurer Christine Bird presented a check for $1,000 to the 2006 O.R.G. Scholarship winner, Robinson "Wally" Fulweiler, a Biological Oceanography graduate student studying coastal ocean denitrification at URI. 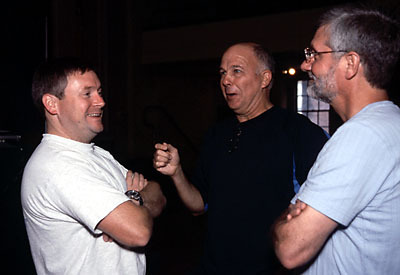 Jonathan, Marty and Dave shoot the bull before the show. "Hey guys, get to work!" 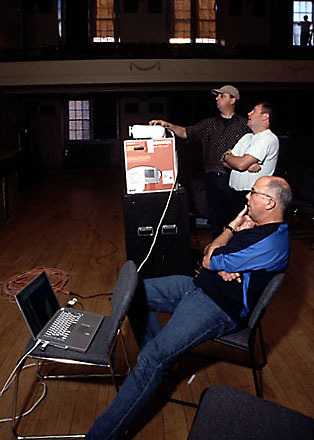 Daryl, Jonathan and Marty work on color calibration of the projectors before the show. Marty likes his color just right! O.R.G. 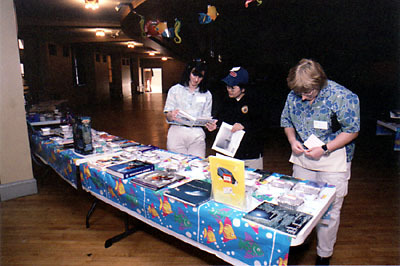 volunteers Amy, Mia and Anna set up a display table with raffle and auction items. 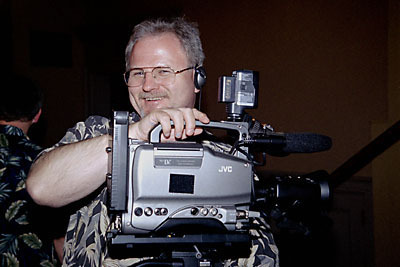 Steve readies the video gear to videotape the event. 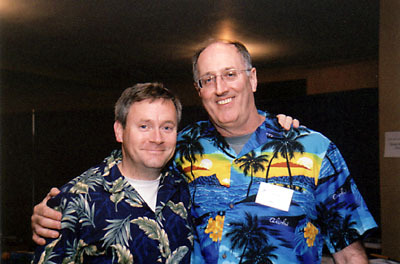 Jonathan and Bill demonstrate the loud shirts which are dress code for volunteers! 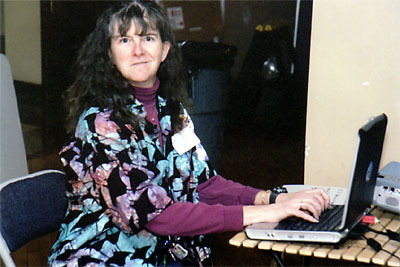 Linda is our very organized head volunteer! Marty hanging out with Christine, 6 months pregnant with our son Liam! 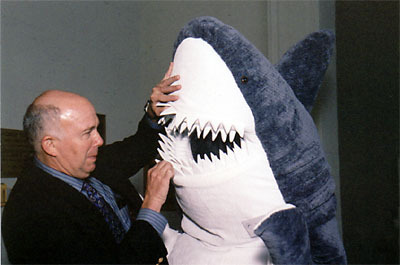 Marty checks the anatomical correctness of Finny's dentification. "Just say ahh." Time to open the doors! Andrew is checking in while Julia and Jack extract donations. 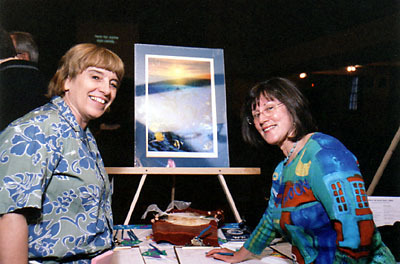 Anna and Jacki check out a limited edition Wyland print up for auction. Finny works the crowd. He is planning on eating Ethan so he can get closer to Jen. Finny is popular with the kids! 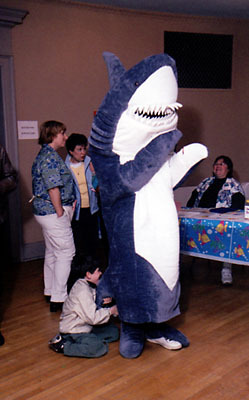 Overcome by hunger, Finny devours a smaller guest of the event. 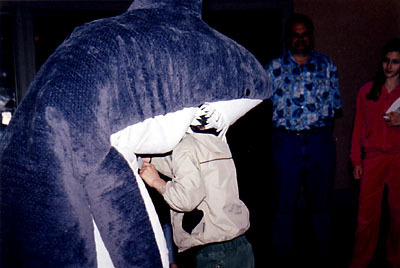 "That'll teach ya to pull my dorsal fin!" Marty takes to the stage and wows everyone with his underwater photography! Christine Bird awards the scholarship to Wally while Jonathan and Art just get in the way. Amaranth Networks, Wyland Foundation , Ikelite, Force Fin, New England Aquarium Dive Club, MetroWest Dive Club, New England Aquarium, Fathoms Magazine, Bobbie Bush Photography, Winter Hill Bank, Trader Joe's, Marty Snyderman, Windkist Equestrian Centre, Bubbles Dive Center, Howard and Michele Hall, New Balance, Andover Photo, Captain Rob's Dive Charters, Divers Alert Network, Andy Martinez, Jim and Pat Stayer, Blockbuster Video, Donald Tipton, Doug Perrine, DUI, Bertuccis, David Hall, Brandon Cole, and our event volunteers!